Having read the books, I looked forward to Dexter when it premiered and have followed the show ever since. (It is different than the novels but still an awesome series.) We have recently started from the beginning on Blu-ray and just finished Season Four. Two new complete series box sets have been announced and they look amazing! (Prices should come down before they get released.) As nice as the Amazon exclusive is below, I NEED the slide box!!! Anyone want to buy my seasons 1-4 on blu-ray?? 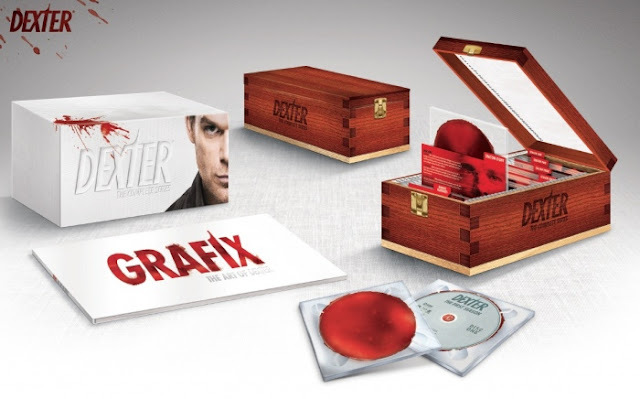 Paramount Home Entertainment has announced the Blu-ray edition of Dexter: The Final Season, and revealed two different Complete Series releases in display-ready packaging: a blood-slide box Collection set and an Amazon.com Exclusive Gift Set. All three contain the eighth and final season, and the two Complete Series sets feature an exclusive bonus disc with more than three hours of extras and an art book. Street date is November 5th. 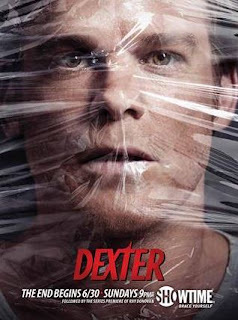 Season Eight Synopsis: The end begins for Dexter (Michael C. Hall) in a climactic new season. After meeting the psychiatrist who helped create Harry's code, Dr. Evelyn Vogel (Charlotte Rampling), and desperately working to save Deb (Jennifer Carpenter) from her destructive, guilt-ridden downward spiral, Dexter must confront his own dark origins. Only one thing is certain... somebody is going to meet their maker. 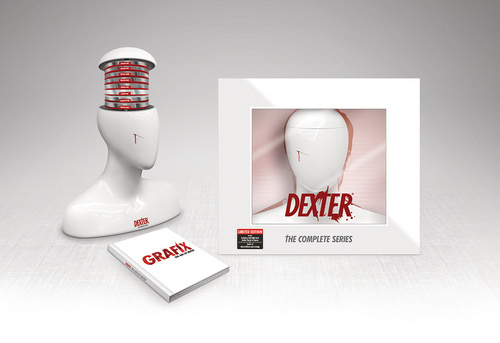 Dexter: The Final Season features 1080p video and Dolby TrueHD 5.1 surround. Extras have yet to be detailed. Dexter: The Complete Series 1-8 Collection and Dexter: The Complete Series 1-8 Collection Exclusive Gift Set include all eight seasons; the first in a collectible recreation of the actual blood slide box used by Dexter Morgan to catalog his victims on the show, the second showcased in sleek, collectible "bust/head" packaging representing an anonymous Dexter kill.